It’s time for our first quarter camaraderie event. The team of MayDae has had an exceptionally busy month. On top of starting this blog, and getting ready to open our Etsy.com shop, we have also been creating all of the decor for the Heaven Fest Fundraisers. The fundraisers were held over the past two weekends, and had about 450 people in attendance over the four nights. 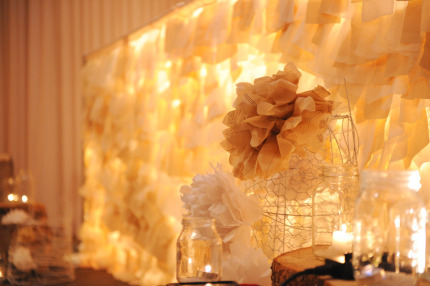 They were held at the Stonebrook Manor in a very large neutral colored room, but instead of trying to fight against the calm expanse, we decided to go with it, and keep things light, airy, natural, and fresh, while giving some glow and sparkle to the space. 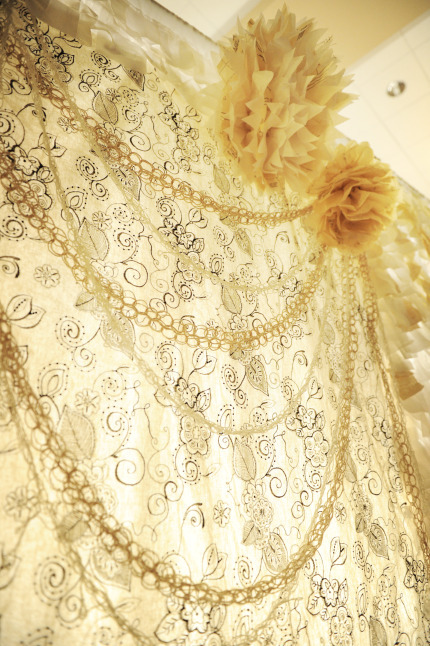 This is the back drape – 15 ft wide by 7 ft tall. We wanted a haphazard look to the squares, and wanted them to be plentiful. 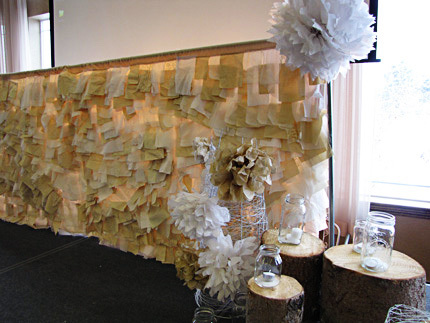 The focal point in the middle was made up of sewing a piece of embroidered fabric in the middle, and attaching finger knitted garlands and large poms made of tissue paper and old sewing patterns. We back-lit the drape for a glowing effect. 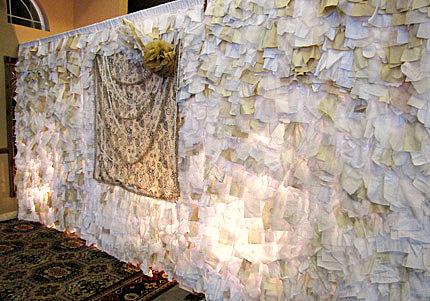 This is the fabric drape that we placed in the front of the room on the stage. 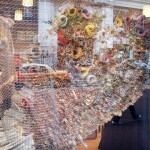 This one was 10 ft wide by 4 ft tall and was also back-lit. 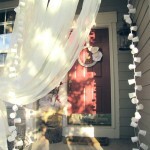 I absolutely LOVED how these drapes turned out, but if anyone asked me to do these again, I would most surely decline! I sat at my sewing machine for longer than I ever had before, and it was murder trying to stuff all that fabric through the small opening. Needless to say, my sewing machine and I are taking a break from each other over the next couple weeks. My next big project was to find the mason jars. 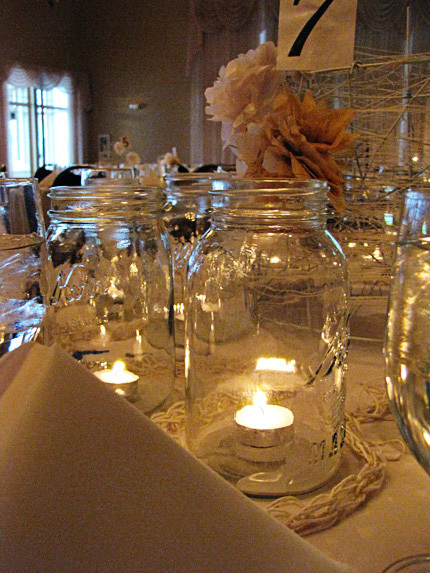 We absolutely adore the look of mason jars with candles in them and we wanted to have lots and lots of these. We needed almost 300 and didn’t have the budget (or the will) to buy new, which meant for 7 weeks straight, I was scouring Craigslist, the flea market, and thrift stores to find these for no more than $.25/jar. Impossible you say? In the beginning, I thought so too, but I am ecstatic to say that I actually got them for less! 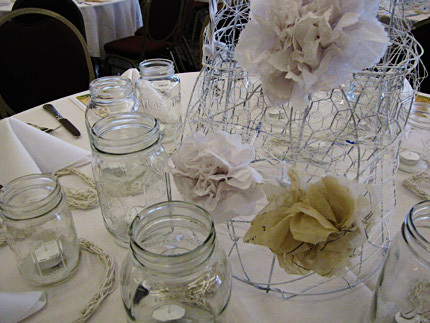 The mason jars looked beautiful and made the tables sparkle and glow in the dim room. 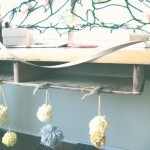 You might be wondering about some of the other decor elements in the photos, don’t worry, because we are not finished! Come back tomorrow to hear all about the wire centerpieces, tissue paper and sewing pattern poms, finger knitting garlands, and candle-lit tree stumps. Are you excited? You absolutely should be. If I lived closer, I could have sewed so you had time for other things. Now with all the Mason jars, you can start canning and making jam and jelly! 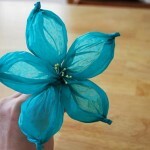 I wish I had known about all the sewing, I could have given you tips to make the job easier. Im wondering about the logs you had near the entrance….did you have something placed on them? I just loved the logs!! Loved it so much! I can’t believe how much work you did on it. It was spectacular!!!! Yes, Steph enlisted my help on sewing for a short hour and I complained the whole time. It was a nasty task she had, but it SO paid off! AND – Storm keeps joking about using it to make herself a wedding dress, so it may save her several hundreds dollars in the end, though she’s not allowed to get married until I am! 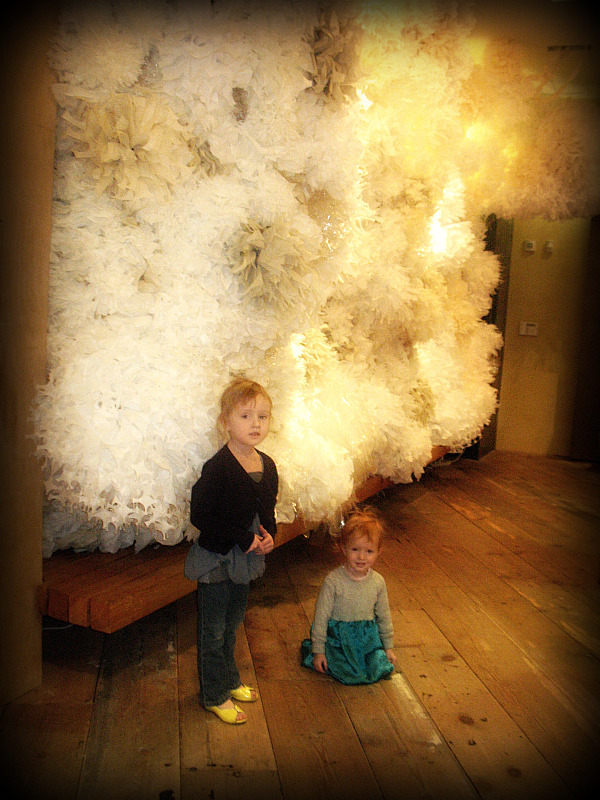 ;) The decor was oh-so wonderful! Thank you both for putting so much time and effort into it!